Thanks ATWAT for the copy! When Eve gets into an accident, her whole life changes. Whisked away to her mothers facility, she fights to survive her injuries. Or does she? Her body heals at a rapid pace, and questions arise on what really goes on behind the walls of her moms research center. Eve meets Solo, a mysterious guy her age who works for her mom. He takes it upon himself to show Eve the way things truly are and together they embark on a fascinating journey. Honestly, I really enjoyed this story. I loved getting a dual view point of what was going on (and sometimes even three point of view). Eve was an interesting character to discover, however, I loved Solo so much more. There’s just so much potential for him as a character and I can’t wait to see how he develops. The relationship between these two was very sweet and real. I really liked having Solo’s input on how he was feeling (I know, I mentioned that already). It was crazy having a novel set in “our time” making everything that much more real. Overall, this book is definitely worth the read. I can’t wait to find out what happens next and how the authors are going to unravel the rest of the story. I’ve been thinking up scenarios since I’ve finished the book. 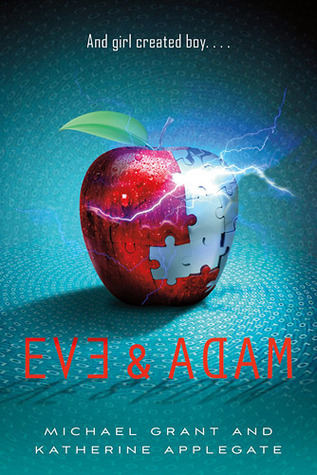 Eve and Adam comes out October 2, 2012! Can’t wait to hear what you think!